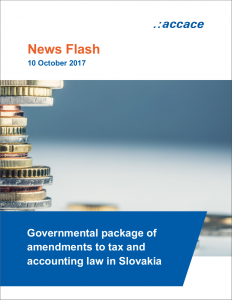 During August and September 2017 the governmental package of proposed amendments to tax and accounting law was submitted to the Parliament for the discussion, that covers significant changes to become effective as from 1 January 2018, especially in the income tax. The aim is to strengthen the anti-tax avoidance rules, to avoid profit shifting out of Slovakia and to increase the tax transparency. In the VAT law, among other things, the recent ECJ case law regarding the application of a special scheme to travel agencies should be implemented. Proposed changes also deal with the accounting law. The rules on the archiving of accounting documents as well as penalty rules are also to be amended. The Parliament should continue in discussion on the proposed changes during these days. To enter into force, the changes must be approved by the Parliament and signed by the President. The most significant changes that are subject to discussion are summarized below. We will inform you about the final outcomes subsequently. In addition to the formal criterion of permanent residence and the place where a person usually resides, the residence will be also explored. If a natural person is provided with permanent accommodation on the territory of the Slovak Republic that does not only serve for occasional accommodation due to short-term visits, he / she will be considered a resident. In case of fulfilling certain conditions, there should be a tax credit for individuals on paid interests on mortgages. Tax credit should be in the amount of 50% of paid interests in given tax period, up to EUR 400 per year. The amount of interest shall be calculated at maximum from EUR 50 000 per one domestic dwelling. Introduction of a new tax allowance for individuals for paid services of spa resorts, that have licence pursuant to special legislation. The deductible item is given in EUR 50 per year of provably paid payments. Entitlement to a tax credit per child can also be claimed by adoptive parent of a dependent child. Establishment of a specific tax regime for the commercial use of intangible assets; it is the exemption of income (s) from remittance for granting the right to use or using registered patents, but also computer programs (software), subject to certain conditions. Furthermore, a special tax regime for the commercial use of so-called embedded intangible assets is to be established, too; it concerns the exempting part of the income (s) from the sale of products in which the registered patent or the technical design protected by the utility model is used. Breaching the arm´s length principle by recipients of the investment aid and the incentives will not automatically result in the disappearance of the granted tax relief, the gravity of the infringement will be examined. Special scheme for R&D will be amended; the amount of deductible item should increase. Introduction of anti-tax avoidance rules with the aim to avoid multiple tax deduction of expenses or of claiming of a tax expense in the case when the related income is non-taxable. The rules for creation of adjustments to receivables and writing off the receivables to natural person in process of debt elimination will be amended. Tax depreciation of technical improvement of real estates in spa resorts falling under special legislation should be subject to more favourable conditions. The possibility of performing contributions in kind, mergers, fusions or divisions for tax purposes in historical values should be limited. With some exceptions, those types of business combinations would be allowed to be performed only in real values. Following the amendments to the Commercial Code a specific tax rules concerning impacts of other capital funds on income tax base should be introduced. The local definition of a permanent establishment is to be extended. Carrying on business through a digital platform used to habitually conclude contracts for the provision of services of transportation and accommodation in the territory of the Slovak Republic will lead to creation of a permanent establishment. The definition of the so-called construction (assembling) permanent establishment should be amended, too, to avoid the artificial division of the activities of interconnected taxpayers in several shorter activities. Amendments cover also the definition of so-called agent permanent establishment, to avoid the misuse of commissioning structures. irrespective where services are provided, as far as expenses on such payments are tax deductible expense. Such income will be subject to withholding tax. Introduction of a definition of a beneficial owner of an income. The definition of related entities for transfer pricing purposes should be stricter. Introduction of a 21% exit tax in the case of taxpayer’s property transfer, taxpayer’s leaving or transfer of their business abroad. In the case of taxation, the fiction of a property sale, or sale of the enterprise or its part should apply. The aim of taxation is to ensure that in the case of taxpayer’s property transfer or changing tax residence abroad, the taxpayer will tax an economic value of all capital gains earned in Slovakia, even though this gain is not realized in the moment of leaving. The property should be understood to cover also intangible assets in the context of a transfer pricing rules under the OECD Transfer Pricing Directive for Multinational Enterprises and Tax Administration. With effect from January 1, 2019, CFC rules are to be introduced, which are consist of assigning the income of a low-taxed controlled subsidiary company to its parent company. Part of the parent company’s tax base will be the income of controlled foreign company to the extent to which the assets and risks are attributable to that income that are connected to main functions of the parent company. profit-shares of more than 50%. Concurrently the income tax paid by the legal person of controlled foreign company is lower than the difference between the corporate tax that the controlled foreign company would pay in the Slovak Republic after the tax base has been calculated in accordance with the Slovak law and the tax paid by the company abroad. As the controlled foreign company is considered also the permanent establishment, while the first condition is not examined in this case. Following the case law of the European Court of Justice, the application of the specific rules extends also to cases where the recipient of tourism services is an entrepreneur who buys a package of tourism services for the purposes of his business, whether for resale or business trips. Foreign persons should be allowed to appoint a tax representative in the case of goods acquisition from other Member State inland for the purpose of its supply to other states. The tax representative can be appointed by those foreign persons, who will conduct trade only by electronic means. If a supplier decides to tax a property that should be exempt from VAT, the buyer is liable to pay VAT if he has the status of a taxpayer. In order to ensure that a taxable person who is acquirer of the property knows that he is obliged to pay VAT on the basis of the reverse charge mechanism, the supplier would be obliged to inform the acquirer in written form that he has decided to tax the supply of the property; the obligation should be meet within the time limit for issuance of the invoice. Terms for trilateral transactions should be amended (the first customer cannot be established in the Member State of the second customer). Introduction of the obligation for taxable persons registered under Section 7 or Section 7a of the VAT Act to file EC Sales Lists when participating in the trilateral transactions. The possibility of issuance of a summary invoice for the rental and supply of electricity, gas, water and heat for a period of 12 calendar months for a foreign taxable person would be introduced. The definition of capital goods is proposed to be extended to all constructions (including civil engineering works or constructions other than buildings). Introducing that in the last tax period the taxpayer has to refund the VAT he deducted upon the payment for the goods or service prior to delivery if, at the end of the last tax period, the goods or service were not delivered to the taxpayer. It shall be considered, that the condition of tax deduction, that is usage of goods or service, was not fulfilled. Introduction of a taxpayer’s rating according to fulfilment his obligation towards financial administrator and enabling specific tax regime for reliable traders. Rule is amending. A legal act or a number of legal acts or other acts carried out for no valid business reason or for any other reason not reflecting economic reality and whose at least one purpose is to circumvent the tax liability or to obtain such a tax advantage that the taxable person would otherwise not have been entitled, in case of tax administration it is not taking into consideration. Increasing of tax transparency (new or more detailed lists of the Slovak Financial Directorate, especially regarding the tax registration, tax obligations, especially in the field of income tax, VAT, special levy of the financial institutions and special levy for regulated industries). Inter alia, the reform of rules introduces the information about the performing of tax inspection or tax execution will not be considered as tax secrecy. The Slovak Financial Directorate will be able to draw up a summary protocol for the tax administration on interconnected transactions of taxable persons at whom breach or circumvention of tax rules has been detected, especially in cases where the tax subjects are involved in the fraudulent chain. Extension of appeals deadline is introduced, from current 15 days to 30 days. Fees for binding rulings will be reduced to half, it means from current EUR 4000 – 6000 (depending on the value of the business case) to EUR 2000 – 3000. Since 1.7.2018, the electronic communication will be obligatory for all legal persons registered in commercial register and natural persons, that are entrepreneurs registered for income tax pursuant to Section 49a of the Income Tax Act. The harmonization of the period of archiving of accounting documents with the period of archiving of the financial statements as the basis for its compilation for 10 years is introduced. The deadline for submitting the notification is prolonged from five to fifteen days. An institute is put in place to initiate the cancellation of a trade license if the entity has not kept accounting books, has not prepared the financial statements, or if the entity carried out accounting records outside accounting books, carried out the accounting record of an accounting event that did not arise, conceal and did not record the fact that is the subject of the accounting. Let’s talk about how we can work together in Slovakia!